Honolulu, Hawaii. US Army Lieutenant Colonel Daniel J. Austin, Commander of The 100th Battalion, 442d Infantry received, on behalf of the 100 BN, 442nd Infantry, the Award for Courage, Honor, Patriotism from the Japanese American Veterans Association (JAVA) at the Hawaii 442nd Veterans Club 71st Anniversary Reunion Banquet that was held at the Pomaika’i Ballroom of the Dole Cannery Building, Iwilei, Honolulu on March 23, 2014. The presentation was made by Admiral Harry Harris, US Navy, Commander of the US Pacific Fleet and a long-standing JAVA life member. 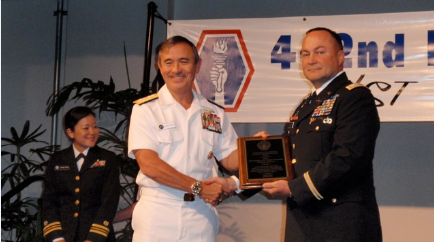 Admiral Harry Harris (center), JAVA life time member, presents the Courage, Honor, Patriotism Award to LTC Daniel Austin (right), Commanding Officer of 100, BN, 442nd Infantry. LCDR Janelle Kuroda, USNR (left) read the citation. Photo by Harley Kudaishi. Admiral Harris recognized the outstanding contribution of the 100th Battalion, 442nd Infantry, to the defense of the nation in the finest tradition of the legendary World War II 100th Battalion and 442nd Regimental Combat Team (RCT). Harris said he would not be where he is today were it not for the Nisei combat performance record during World War II. “For continuing to execute its mission in the finest tradition of the World War II Nisei combat units, and for perpetuating the legacy of the 100th Battalion, the 442nd Regiment Combat Team, and the Military Intelligence Service, JAVA is honored to present its highest commendation, Courage, Honor, Patriotism Award, to the 100th Battalion, 442nd Infantry. Lieutenant Colonel Austin, in his acceptance remarks, said the men and women of the 100th Battalion, 442 Infantry, live and work by the high standards of performance and patriotism set by the men of the 100th Infantry Battalion, the 442nd RCT and the Military Intelligence Service. A life member of JAVA, Colonel Austin requested that his appreciation be conveyed to the JAVA Executive Council for this recognition. The Courage, Honor, Patriotism Award is bestowed on a persons or an organizations that exemplify the spirit of courage, honor, and patriotism shown by World War II Nisei soldiers. Recipients of the Award clearly demonstrate by their personal or professional activities to have the courage of their convictions in the face of criticism and adversaries (courage), have achieved a high level of public esteem (honor), and have shown devoted loyalty to America (patriotism). The reunion banquet was attended by State Governor Neil Abercrombie, Mayor Kirk Caldwell of the City and County of Honolulu, Congresswoman Colleen Hanabusa, and US Senator Mazie Hirono. The keynote speaker was Eric Saul, historian and curator. JAVA appreciates Hawaii 442nd Veterans Club and the banquet committee for allowing JAVA to make the presentation at this event.